Although it's difficult to remember at the time, try to realize that rude co-workers aren't necessarily reacting to you. (CareerBuilder.com) -- Unfortunately, rude co-workers are common. Disrespectful, bad-mannered co-workers exist at virtually every workplace and communicating with them can put a major damper on your day. As you deal with the problem, it's important to not take their behavior to heart, experts say. "They're rude because of something that's going on with them. Don't take their behavior personally," says Scott Eblin, author of "The Next Level: What Insiders Know About Executive Success." Before you start pointing out all of your rude co-workers, make sure you're not the one overreacting, suggests Martha Newman, an executive coach and former business litigator. Be truthful with yourself about what's really bothering you and look at it from the perspective of both parties. "A thorough self-examination will determine if your agitation is really the result of a difficult person's actions or your own sensitivities." Whether it's a colleague you can trust or a friend outside of work, getting a second opinion about a rude co-worker may help you put your thoughts in perspective. Ask the friend to help you and "start brainstorming ways to address the situation," Newman suggests. "Unlike you, they won't be feeling anger, pain or humiliation, and will be able to give you sound, objective advice." No matter what you decide, wait for one or two days before carrying out your plan to prevent any hot-tempered words. Once you've pinpointed the problem, it can pay to try the nice route first. Even though it can take a lot to be nice to someone who is rude, this can pave the way to a more collegial relationship. "When they're rude to you, be polite to them. Your behavior may influence theirs in a positive way," Eblin says. If the situation persists, approaching your co-worker can be a good idea. Simply tell her how her behavior makes you feel rather than pointing out her mistakes or telling her what she has done wrong, Newman says. "It's important to avoid the blame game and seek ways to avoid a repetition of the undesirable behavior," she says. Having a few specific examples in mind can help your co-worker understand your point of view. If a co-worker's behavior is unacceptable, it's important to stand up to the person. Acknowledge the problem in an assertive manner without insulting your co-worker and deal with it as soon as possible; there's no need to wait until the situation gets truly unbearable. "When not nipped in the bud, rude co-workers can treat your silence as lack of assertiveness and authority. This can result in the rude behavior perpetuating and escalating in severity," says Celestine Chua, a life coach at the Personal Excellence Blog. 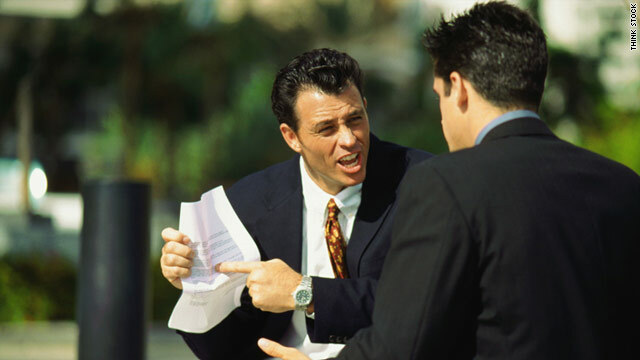 Make sure your conversation ends with specific ways to end your co-worker's unwanted behavior. Suggest changes or methods that can improve your relationship instead of simply pointing out his rude behavior. Come away with several ideas on how you can improve the working environment and stick to the plan. If the problem persists and is a constant distraction at work, going to a human resources representative or a manager can help you deal with the co-worker by documenting his behavior. Be as truthful and easygoing as possible when speaking to HR or a supervisor. Prepare a strong case and share it without getting too negative or defensive. "Always choose composure over emotionalism," Newman says.